Thank you very much. It is my great honor and pleasure to be with all of you this evening.It is especially a historical, timeless, tradition for people who are seeking to spiritual enlightenment, to gather together on the banks of the sacred River Ganga. The great sage Vidura sat on the bank of the Ganga, just close by in Haridwar and inquired from the Mahatma Maitreya Rishi. From that discussion, within our Puranas are many chapters with philosophy and stories, which have inspired people’s hearts for thousands and thousands of years. There is a beautiful story of the King with name Parikshit. He was very pious in every way. He was the type of king that everyone loved, and in those days, they did not have to run for elections every few years. It was something for life, because he did not see anything as his own. He considered his body, his family, all of the citizens, all of his property, everything in creation, to be the property of Bhagavan or God, and he considered himself a humble caretaker, and a servant of all. The power and the wealth of being a king did not make him arrogant; rather it only increased his humility, because he understood that every living being is a child of God. 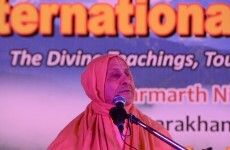 Aham-bija-praja-pita, in the Bhagavad-Gita, Lord Krishna tells, “I am the father and mother of all living beings.” Therefore, Parikshit Maharaj considered everyone as his praja. That means he treated every citizen, whatever social or spiritual status in society they may have been, whatever their race or color, even whatever their species may be, wherever there was life, he considered it a sacred part of God. He treated everyone like a father or a mother, which would treat the child: to protect, to inspire, to educate, to nourish, and to forgive. But somehow or other, it is a long story, he made a mistake, a little mistake, because however great, intelligent, and powerful you are in this world, somehow we always make mistakes. By this mistake, he was cursed to die in seven days. Now, in those days curses actually worked. But today, if somebody curses you to die, you would say, “So what? What’s next?” Curses don’t work so good these days, and if they do, you can easily get around. It was a child that cursed, because he was very angry based on miscommunication. Now, king Parikshit he could have, if he wanted to, he could have counteracted. He was in charge of all the greatest military and also he was a great yogi, he had tremendous cities and powers, and he could have counteracted it if he wanted to. He could have declared a war, he could have punished his offender, but he was a higher yogi than that. He sought it as God’s blessing. The purpose of life is self-realization, athato brahma jignasa. Everything has a beginning and end in this world. Time is so powerful, you cannot see time, you cannot feel it, touch it, taste it, hear it, smell it, it is so subtle, subtler than the senses, subtler than the mind, subtler than the intelligence, it is subtler than the ego, and it is subtlest thing. Yet, it is so powerful that it is in the process of burning out the sun, drying up every ocean, and making every planet into powder. The Himalayan Mountains will turn to dust in course of time, what to speak of our little bodies. If we live 100 years old, and if you are from England, the Queen of England will give you a special award, personally, and it is worth living for some people. But what is 100 years when you consider the span of eternity, which is actually the only reality. know, I have seven days, so what will I do with each moment of the seven days.” He was happy. Not that he did not like his life; he loved his life; but he understood that his life is more than just what is in this little shell called the human body. 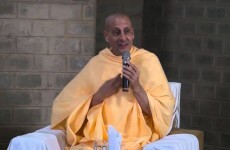 The Gita tells, “For an enlightened person, death is like changing clothes.” It is not that you don’t take care of your clothes while you have them; you take care of clothes if they are used for a sacred purpose. But, when the time comes, we understand that life is beyond this, it cannot change my identity or my relationship with that which is sacred. Parikshit understood these things. So what did he do? He left his palace and decided that he was going to fast for the next seven days, because he wanted to give all of his energy, and all of his attention towards his enlightenment; it is all that really mattered anymore. He came to the banks of the holy River Ganga, not too far from here. If you drive from Rishikesh to Delhi, you pass the city called Merut. If you turn right, about a half hour drive, there is one of the most sacred places called Suk-taal. Parikshit Maharaj came under this banyan tree and said, “I’m going to fast till death near the holy river Ganga and I want to hear. I want to hear about the real value of life.” It was such a dramatic experience. This is about 5000 years ago and there was no internet, television, twitter, or of any of that stuff, but somehow or other the word spread immediately because yogis have a much faster, and more efficient way of communicating than all that stuff. So all the great yogis in the world and the universe wanted to be there, to help him attain perfection during his seven days, because they were so grateful to him. He was a husband, he had children, and he was performing so many apparently worldly activities, but the greatest renunciates came in from the caves of Himalayas, Sahyadri mountains, Vindya mountains, jungles, and forests. As they were great yogis they could come really fast. It was a setting where, what we would call in today’s world, an all-star cast of sages rishis, yogis, sages, that are glorified in Mahabharata, Ramayana, Puranas, Itihasas, and Vedas. They were out there and if anyone had any ego, they would have thought, ‘I’m the one who should speak,’ because whoever was going to speak this talk in front of everybody was going to be really famous throughout history. At that moment, a 16-year-old boy, whose name was Sukadev, happened to come from the forest. He was son of Vyasdev, the literary incarnation of Bhagavan Sri Vishnu. When Sukadev was in the womb of his mother, he was brahman realized; he realized, ‘I’m not this body. I’m not any thing about this world.’ He understood that there are many temptations and challenges, which can entangle you in the network of karma, in this world. He was satisfied. So he decided that, ‘I am just going a stay in the womb of my mother. It is not very comfortable but there are no distractions.’ He was in the womb of his mother for 12 years, until finally, Vyasdev brought Krishna from Dwarka to ask him to come out and finally he came out. It’s a long story but he was walking. He was so oblivious to material existence that he did not bother putting on clothes, not as a fashion or because he was a part of some sect. It is just that it was not something he thought about; he didn’t think about doing it or not doing it. 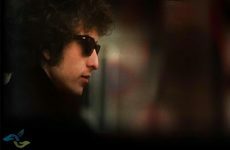 He was totally immersed in his liberated state and common people thought that he was crazy. He was going through a village and people thought, ‘what is this madman? He doesn’t even say anything.’ They started throwing things at him, spitting on him, ridiculing him and harassing him; but he was just smiling and walking. He came into this wonderful gathering, where all the sages, rishis, yogis were sitting with the emperor of the world, and everyone stood to receive him. He was just a young boy, a teenager. When all the village people saw that he was a great sage or rishi, they got afraid and went away. 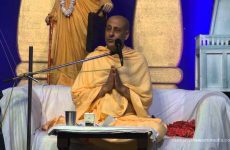 Everyone there unanimously accepted saying, “There is no one more qualified to speak to the king than Sukadev, because he has heard very carefully from his Guru Vyasdev. He has understood and he lives by with his words, with his actions, and with his thoughts.” Even his guru was there, Vyasdev, and he didn’t say, “No, I’m is guru. I should speak.” He was thinking, ‘No, he is more qualified than me.’ This is the way the great yogis were in those days. So they gave Sukadev the raised seat of honor, and all the rest of them sat on the ground, along with the King. Would you like to hear the three questions? He was a king. So he had been around and he knows everything about what’s going on in the world. He could also sense what was going to happen in the future. This was around 5000 years ago. He asked- of the many religious, spiritual paths and so many different scriptures and philosophies, I don’t have time right now to study all of them, please tell me, what is the very essence that one should understand and live by? He didn’t want some sectarian teaching. He wanted the underlying truth that is the very purpose of all great spiritual traditions. His second question- what is the foremost responsibility for every human being? And his third question, which is so relevant to each and every one of us, what is the prime duty of a person who was about to die? 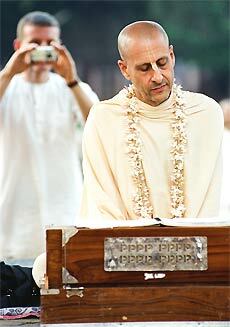 When Sukadev Goswami, the 16-year-old boy, heard those questions, he became blissful. 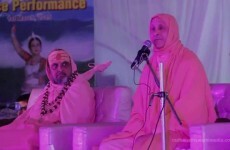 He honored the king; he said, “You are glorious and your questions are glorious, because the answers to these questions are meant for the ultimate benefit for all living beings.” It is very interesting that this historical event took place, just downstream from where we are sitting now, near the holy River Ganga. Sri Chaitanya Mahaprabhu, the Yuga-avatar, the avatar of this age, lived on the bank of the Ganga, in Navadwip. He spoke about the glories of the Ganga and said, “The River Ganga is very sacred and she has descended from God, himself. She is the feminine aspect of the one supreme absolute truth. She is a shakti, lhadini shakti of the Lord. Her liquid is not just water, but it is permeated with grace, with blessings. When we become purified of our egoistic selfish attachments of our misconceptions, then we realize who we really are, and we realize our true nature, which is sat-chit- anand: eternal, full of knowledge, and full of bliss. What is that bliss? The essence of bliss is prema or love. Ganga appears to be water but that water is permeated with prema, with God’s love, with God’s compassion, for all beings. So, the greatest, enlightened sages, rishis, and yogis worship Mother Ganga; they are not just worshiping a river. Just as an example, we have this body, some of us are women and some of us are men, some of us are tall and some of us are small; but it is the atma or the soul which is seeing through the eyes, hearing through the ears, tasting through the tongue, and feeling through the flesh. It is the atma that gives life to the body. The energy, the consciousness of the atma, the soul, is in every cellular atomic particle of the body. That is why if somebody pinches you, you feel it. If you pinch a dead body, that body doesn’t feel anything, because there is nobody in there. The atma is within our heart, but the energy of the atma is pervading the entire body. So, similarly, Ganga, the river, is the body of Goddess Ganga and her spirit, infinite, eternal grace, is in every drop of that water which is permeating the whole river. How does she permeate the river? She permeates with her blessings and with her grace. Faith is very important. Otherwise, why would we do anything out of the ordinary? To pray to God, to perform meditation, even to perform asanas, it is required that we have faith that we can get something good from this, otherwise why bother and you can just watch television. People give up so many things that ordinarily give them so much pleasure, because they have faith in something higher. We go to school rather than playing, but we have faith that if I go to school, there would be a better life for me in the future than if I just play all day long. And all these great yogis and rishis have taught us that what we see with the Ganges, we should learn to see through our ears. We are just seeing water, but when we hear from those who have realized, who have experienced, and who have understood the infinite grace that is flowing in every wave of mother Ganga, then we learn that she is our true mother, Mother Ganga. It is that same female divine energy that is the mother of all living beings. She is flowing, she is giving us water for physical life, she is giving this beautiful song for our emotional happiness, and she is giving us grace, to liberate our very souls from all suffering, from birth and death, and ultimately beyond the highest platform of liberation with the awakening of our love of God, and love for all beings. Parikshit Maharaj knew that if he was in the association of saintly people on the bank of Mother Ganga, he would attain the highest perfection in his life and he did it in such a way that countless millions and millions and millions of people would attain that same perfection just by hearing about it and reading the Bhagavat Purana, Srimad Bhagavat. So, I’m very grateful to be here on the bank of the Ganga with all of you. I was asked to speak about- the qualities of a yogi. So, now I will begin my talk. I only have a few minutes now. Throughout Bhagavad-Gita, it describes the qualities of a real yogi. 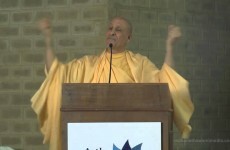 But within the scripture I was talking about, Srimad Bhagvatam, at suka-taal, Sukadev Goswami was speaking to Parikshit Maharaj on the bank of the Ganga, he is telling the story of Vidura asking questions to Maitreya Rishi in Haridwar on the bank of Ganga. In that, there is the beautiful story of the avatar Kapila Dev. His mother Devahuti was a very illustrious lady. She was in a very difficult predicament in her life and she approached her son for direction. Kapila Dev spoke the sankhya philosophy. Within those texts, Kapila Dev explains the qualities of a true yogi. I would like to speak briefly of these characteristics. Titiksava means tolerance. There are so many different perspectives of this word. My own beloved Guru Maharaj His Divine Grace A C Bhaktivedanta Swami Prabhupada wrote in one of his books that, “The greatness of a person should be estimated by how that person is able to tolerate provoking situations.” That is actually the test of our greatness and not just how nice we are when it is nice; but it is how we tolerate provoking situations. What does it mean to tolerate? On one level it means to tolerate temptations that if I give up my ideals, if I give up my integrity, I could get so much, and on another level it means to tolerate fear that if I do not give up my integrity and my ideals, I could loose so much. There is one thing that we can be absolutely certain of, when the sun shines in the summer then winter is coming, and in the coldest days of the winter we can be sure that summer is coming. They are always changing. It is very difficult to tolerate pleasure pain, happiness distress, but we have to tolerate both, the good times and the bad times. Because our souls are full of bliss and they are always looking for pleasure. But the problem is, when we are looking for it in temporary fleeting things that have such minimal value, there is never that quality of pleasure, because the soul is looking for something that is deep and profound. It is looking for eternal love. Nothing could substitute that and it is within us. So the Gita says, one should learn to tolerate these things without being disturbed. This is a yogi. The Gita goes on to tell that just as a tortoise, who puts his head and limbs outside the shell when there is something to do, but then, if some difficulty comes it withdraws its limbs within the shell. So similarly, a yogi, according to these teachings of Bhagavad-Gita, is fully active for seva, but when it comes to selfish, egoistic impulses, he draws limbs within the shell. It describes that a true yogi rejoices within, is satisfied within, is illumined and enlightened from within. That is real intelligence. No just grasping and grasping for things and things. There is a saying- in a cultured society, people love people and use things, but in the world we live in, too often, people love things and use people to get them or keep them. That is a very shallow, unsatisfying life, a life with a heart, which is constantly starving; and to divert our attention from the starvation of the heart, the mind is always looking for so many things to occupy itself with. This means, real wisdom is to see whether one is a very enlightened brahman, or sage, or whether one is just a simple person doing labor work, or whether one is an elephant, or a cow, or a dog, or a cat, or wherever there is life, it is sacred. A saintly person understands how to deal with different types of variegatedness within this world, but always in the spirit of respecting the inner life within it. Male, female black, white, red, yellow, brown, Hindu, Muslim, Christian, Jewish, Jain, Parsi, Buddhist, agnostic, atheist, the atma or the soul has none of these identities. We can be rich or poor, educated or uneducated, we can change the religion, but the atma never changes. When our compassion expands beyond the limitation of our ego of being humans, then it extends to all of the animals, birds, fish, and trees and wherever there is life. This is a sacred piece of God. Can I tell you a little personal story? On January 26, which is the Republic Day in India, I was just minding my own business, sitting in a little room, where the walls are covered with cow dung, in Mumbai, at our ashram, and I got an invitation from the President of India in Delhi at his palace, the most prominent palace of India, the presidential palace. He was going to have a reception for Barack and Michelle Obama, and the Prime Minister, and all the leading people of India were going to be there. So there were about 150 guests: all the ministers and chief ministers of the Federal Government, President of United States, Prime Minister and President of India. They were all sitting there and I was about as far as I was from all of you. It was in the back garden. I was just watching as everyone rose when a military band played the national anthem. I was very appreciative of being there. The highlight of my experience was this. A bird flew overhead and I was looking up at the bird in the sky. Then I was looking at the Prime Minister, the President, the Cabinet Ministers and everyone else. Then I was seeing that the bird was looking down at us and I was looking up at him; I was thinking that bird is a living person, is an atma, is a part of God. I call God, Krishna, the all-attractive, all loving one. I was thinking, this bird is a child of Krishna and so is the President, the Prime Minister; they are also children of Krishna. Spiritually we all have the same kind of souls. I was thinking, the bird cannot rule over the government, but the rulers of governments cannot fly in the sky either. So, God has given us all special qualities, special features, and it was just so beautiful to see the simplest feathered being with as much love and appreciation, as I am seeing the most powerful people in the world. Because, after all that bird can become a Prime Minister and his future life, and the Prime Minister’s could become birds if they live accordingly. So the idea that Gita is teaching us, of how a yogi sees every living being with equal vision, is in the context of compassion. There is no value of just seeing people with equal vision, unless we love them and we feel compassion for them. It is said that a yogi is para-dukha-dukhi, a primary feature of a true yogi, that another person’s happiness is my happiness, and another person’s suffering is my suffering. When we actually understand, who I am, then we can understand our true relationship with every living being, that is love, universal compassion. It describes in Gita that a true yogi sees, a pebble, a stone, and solid gold, with equal vision. How is it possible? There so many stones here, but we are not picking up; but if there was gold there, we might be tempted to pick it up. It is not that they don’t see the differentiation. They understand that real wealth is not about stones or gold, it is about love, peace, happiness within; it is about tapping into God’s grace, Krishna’s grace. That is where real wealth is. In the bible, it is said, Lord Jesus told that don’t make your treasure in this world, make your treasure in the kingdom of God; because in this world whatever your treasure will be, it is going to be corroded by time, it is going to be subjected to rust, moths and thieves. But if you find your treasure within yourself, the kingdom of God is within, there are no thieves, there is no rust, and it is secure, and forever. It describes how a true yogi has no envy towards anyone. This is one of the hardest things. A true yogi is a real well-wisher. It is only because of emptiness, and anxiety due to emptiness that we are envious, and we don’t want to see anybody else succeed. But when we find that happiness within ourselves, then our greatest joy is to see other people blessed, other people empowered with grace, and other people doing wonderful things for the betterment of the world. Krishna explains in Gita, how this is possible. It is not difficult to give up our materialistic, selfish, egoistic tendencies, if we experience something higher, param drstva nivartate, that higher taste. On the path of bhakti that higher taste is prema or love, to feel God’s love, and to be an instrument of God’s love in everything we do. There is a beautiful story that tells about such a yogi’s qualities. He was also a king. His name was Ambarish. For the welfare of others, he went into a forest. The name of the place was Madhuvan, on the bank of the River Yamuna, in the area of Vraj-bhumi. To purify himself and to invoke divine blessings upon everyone in the world, he fasted for many days with his whole family. They were in a secluded place and as they were fasting for so long, they were actually on the verge of death. At the end of the fast, a big plate of sacred food, prasadam, was brought to them. As they were just about to honor prasadam, at that moment, Durvasa Muni, one of the greatest historical sages, came in. Durvasa Muni is a yogi, who never sleeps indoors; he sleeps only under trees or in caves around riverbanks. He only wears tree bark as clothes, and he has long matted hair. He has incredible yogic siddhis or mystical powers, very powerful, and learned. Wherever he goes, 60,000 babaji’s and yogis would follow behind him who were his disciples. So Durvasa went to the Yamuna River and while he was there, he entered into a state of samadhi. So his bath was taking a really long time. Ambarish was told by some saintly learned scholars, who were with him, that according to the tradition, you have to break your fast by a certain time otherwise the benefits of your fasting are not going to be effective. They were all confused. It would hold hurt the whole world if he did not break the fast in the right time because he was fasting for everyone. Also, he did not want to be impolite to a yogi. And everybody said, “Yes! Yes, that’s true. Drink some water.” So he drank a single drop of water. Durvasa was a celibate monk. He was in the Yamuna River and all of a sudden in his samadhi he saw Ambarish drinking water. He was furious. I have seen that sometimes people fast and as they are fasting, if they see anybody eating, they look at them with disdain, thinking, ‘Today I am fasting and your eating.’ But that means his belly is fasting, but his ego is feasting. Durvasa muni was really a yogi, on one level. He pulled one of his matted hairs from his head. He held it up, just a single hair, he chanted a mantra, and he dashed the hair to the ground. What came from that hair was a blazing enormous fire, the fire was the body of a person, and that fiery body was screaming in anger. He attacked Ambarish to burn him into ashes. Ambarish was just standing there; he had no fear. He was feeling embarrassed that, ‘I drank the water. I should have waited.’ He was standing with folded palms, no fear, and no anger, sharanagati. He just gave his heart to Lord Narayan and he prayed, ‘My dear lord, if you want to protect me, nothing could kill me, nothing can harm me; and if you think it’s my time to go, nothing can protect me. I am yours.” In loving remembrance of the Lord, knowing that he is the eternal soul, he just closed his eyes with gratitude for whatever was happening. Lord Vishnu, to protect his devotee, took his primary astra, the sudarshan, which is like a wheel, and liberated the fiery demon. Durvasa Muni saw that, ‘What is this!’ Then that sudarshan chakra came towards Durvasa Muni. Durvasa Muni immediately turned his back and ran away, as fast as he could, but the weapon of Vishnu was following behind. He ran really fast and when he could not run faster, he started to fly. He had these powers. Wherever he went, chakra was just behind him and he could feel the heat of it. And Durvasa Muni understood that, ‘I’m considered all over the place to be the greatest of the yogis, but this household man, who has family, who is doing his work and everything like that, who is so humble, and who is not showing any siddhis,’ he thought, ‘he is greater yogi than me, because he has complete satisfaction of the mind, and is totally forgiving.’ Durvasa Muni went all the way back to Ambarish. The chakra, the wheel of Vishnu, went away. Durvasa Muni bowed down to Ambarish’s feet and Ambarish bowed down to Durvasa’s feet. 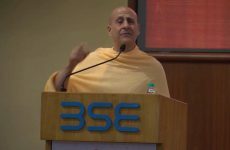 Ambarish apologized and said, “Just see, because of me you had to go through so much trouble.” Durvasa understood, ‘this type of forgiveness, this type of being compassionate beyond the faults of others, is the true quality of the yogi.’ From that time, wherever Durvasa Muni goes, he glorifies this quality. This chanting of mantras, kirtan, is especially for that purpose, to tune in to the divine grace, the frequency of grace that is everywhere and within ourselves. When we tune into that grace, it takes us to that inner happiness that cannot be disturbed by any situation in this world, because it is beyond. When we tune into that grace, it empowers us to be an instrument of that grace, an instrument of that love. That grace cannot be attained, it can only be given to us, revealed to us, when we open our hearts completely, through our spiritual practice, through this association of people we keep, and through our the character in which we live. So I would like to end by having a little kirtan, wherein we meditate on tuning into that spiritual grace, that essence within all of us.